Cognac is named after the town of Cognac in France. Cognac is one of the famous variety of brandy produced and is sometimes known as the "mother of brandy". Cognac is produced by doubly distilling the white wines and stored in barrels for at least two years. It is also known as a healing drink, and has been known to relieve colds and headaches. 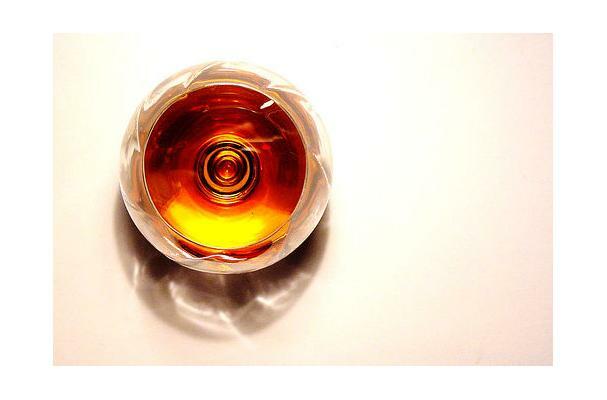 Drinking around 15ml of Cognac regularly also helps protect you from heart disease. liquid substance that contains alcohol percentage. Choosing: Learn more about the grades of cognac before you buy your first bottle. "VS" cognac, or "very special," indicates that the youngest brandy used in the cognac has been aged in a cask for at least 2 years, while "VSOP," or "very special old pale," has been aged for 4 years. "XO" cognac, which stands for "very old," has been aged in a wooden cask for at least 6 years and is also known as Napoleon or Hors D'Age cognac. Familiarize yourself with the other designations used to classify cognac, which usually identify the specific region where the liquor has been distilled. These classifications may include Grand Champagne, Petite Champagne, Borderies, Fins Bois, Bons Bois and Bois Ordinaires. Each region produces a cognac with a slightly different flavor, which is attributable to variations in the soil where the grape is grown. Buy a good bottle of cognac by reading the labels on the bottles. Cognac labels are usually very informative when it comes to telling potential buyers about the grapes used in the distillation process. Choose the best cognac that fits into your budget. While it is easy to buy a good cognac for a reasonable amount of money, some of the rare types of cognac may rank as the most expensive types of liquor available. For instance, some cognac may have been aged for as long as 200 years and may cost a small fortune. Use online resources, such as Cognac World, to learn more about how cognac is created and how to buy a good bottle of cognac without seeming like a novice (see Resources below). In addition, Cognac World offers links to sellers of fine cognac. Learn cognac terms. For example, the term "fine" indicates that 100 percent of the grapes used in the cognac came from a specific region. So a cognac that is categorized as fine champagne was created using only grapes from the Champagne Region of France. Buying: You can buy Cognac on local supermarkets or liquor shop. Cognac can be used in both desserts and entrees. One delicious way to cook with cognac is to use it as a flavoring for meat dishes by utilizing a cooking technique called 'flambéing', in which alcohol is ignited during the cooking process to produce a unique flavor. The best way to learn is by doing, so what follows is a quick and easy recipe for peppercorn steak with cognac-cream sauce which involves flambéing as a key step. One way to cook with cognac is by flambéing your food with it. Flambé, which means 'flamed' in French, is a technique by which liquor is added to a hot pan, causing the alcohol to ignite. Chefs typically flambé just as their dish is finished cooking so that the sugars in the alcohol do not burn (the flame is caused by the alcohol and subsides in a few seconds). This is often done with red meat, but can be useful in the preparation of other foods as well. Any dish that is cooked at high temperature on the stove-top can be flambéd including crêpes, shellfish, and steaks. When flambéing with cognac, ensure that nothing flammable is near the pan and that the fan above your stove is turned to high. When your dish is almost finished cooking and the pan is hot, add one tablespoon of cognac to the pan and step back. A flame will immediately catch and your food will flambé for several seconds. Do not continue cooking at high temperature once the flame subsides, as the sugars in the alcohol will quickly begin to caramelize and burn. Savory sauces often include liquor such as cognac or brandy. These sauces can either be created after flambéing or without utilizing that technique. To create a sauce after flambéing with cognac, simply add another liquid to the pan and heat through, mixing with a wire whisk. The possibilities are endless, but try adding a half-pint of heavy cream after flambéing red meat -- the resulting sauce will be rich, sweet, and savory. Some recipes utilize cognac in sauces without flambéing. This type of sauce will always be cooked at low-medium heat because high temperatures will cause the alcohol in the cognac to ignite. For example, try sautéing shallots and bacon in butter, adding parsley, and finishing with a dash of cognac. The result is a delicious sauce for seafood. Lastly, cognac can also be used in sweet dishes. Again, cognac and cream are a perfect combination. Try adding cognac to chocolate mousse or whipped cream for an even more decadent dish. The flambé technique can be used with beef, pork, or any other red meat to add a unique flavor early in the cooking process. Cognac or brandy tend to impart the most flavor. Liquor imparts a strong flavor. You don't want it to overpower the other elements of a dish, so keep in mind that a little goes a long way. Flambéing is a technique which intentionally ignites alcohol. Ensure that you and any flammable objects are at a safe distance from the fire. Alcohol burns rapidly, so the process only takes a few seconds. Never use any liquids with an alcohol content of greater than 40% (80 proof). Find a dark, dry area where you can keep your cognac bottles at room temperature, and place each bottle upright in order to prevent the cognac's flavor from being tainted by the cork. Feel free to store unopened cognac bottles in a dry, dark space at room temperature for years at a time, as the cognac will not age in glass bottles. Meanwhile, opened bottles of cognac should ideally be stored no longer than six months, as the alcohol may oxidize and begin to lose its flavor. Place the cork back in the bottle as soon as possible after pouring cognac, since an open bottle will lead to the cognac's evaporation over time. Serve your cognac in normal wine glasses or in tulip-shaped glasses rather than the typical balloon-shaped variety in order to enjoy the full bouquet of the brandy without losing any of the flavor preserved during storage. Get the most out of your cognac by testing out cocktail recipes that require it. Never store a cognac bottle horizontally. Since the early 1990s, cognac's American consumer base shifted from an older, affluent white market to younger, urban, and black consumers. History: The Saintonge vineyards were probably created in the last quarter of the 3rd century A.D. It was when the Roman emperor Probus extended the privilege. Since the end of the Middle Ages, the wine trade had been developed from the port of Bordeaux. The marriage of Alienor of Aquitaine with Henry Plantagenet had thrown the Guyenne over to the English, who established, in the 18th century, a monopoly of the wine production and commercialization in Aquitaine. * - the other one to the north of Bordeaux, in the Charentes (Cognac), its production having been transported on the river Charente and from the port of La Rochelle. Wine was then indispensable to provide daily drinking needs for the sailors, who were making long sea voyages and who couldn't keep their drinking water for very long. During the second half of the 16th century, many Dutch ships came to the Charente to look for the famous "Champagne" and "Borderies" vintages. In the 17th century, the Dutch acquired a habit of importing the Charente vineyard's products in the form of brandy, which meant a reduced cargo volume and was thus cheaper to transport. Once mixed with water, this product recieved the name of "Brandywine". It was also noticed that this brandy, traditionally kept in cask, improved with age and could be drank dry. That's how the "cognac" was born. During the 17th and 18th centuries, certain enterprising merchants founded, in principal region's cities, trading posts and started to export their cognac to the North America, West Indies and Indian Ocean Islands. Toward 1830, these companies acquired little by little a habit of exporting the cognac in bottles instead in casks. Apart from the specificities of each production, different kinds of cognac were distinguished by their origin and their age.